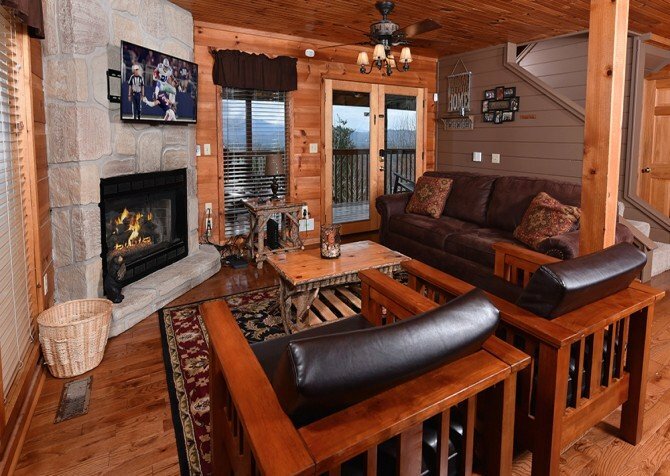 Perfect for a fun family trip or a much-needed girlfriend getaway, Bear View is a 1-bedroom + loft, 2-bathroom home nestled in Pigeon Forge. 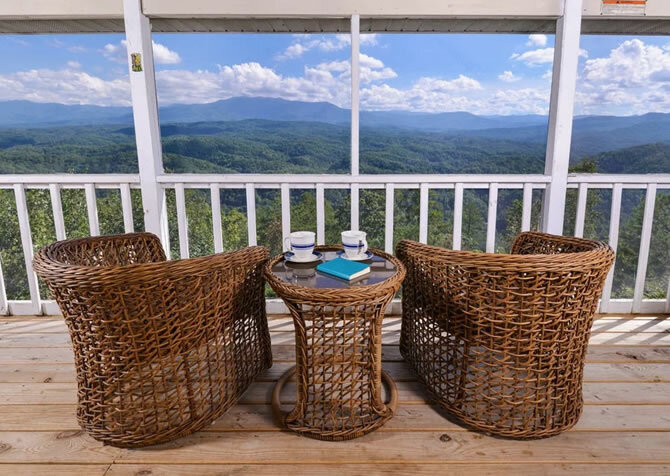 Featuring forested views, a TV in every bedroom, an indoor jetted tub, and an outdoor hot tub, this home away from home in the Smokies will usher each guest into a realm of relaxation. 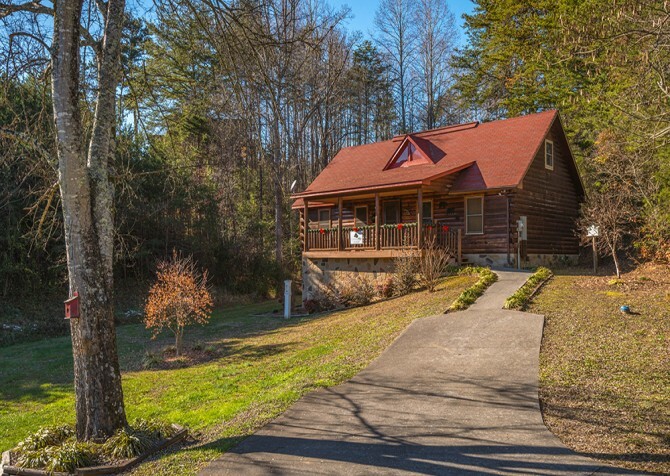 Breathe in the fresh mountain air with a bowl of fruit on the back deck, watch a family film on the flatscreen TV in the living room by the stone-bordered fireplace, play a friendly match at the pool table while the kids battle on the Xbox, and head to dream land every night in the 2 king-size beds. Step into the living room just of the front door, where your vacation begins your way — with a rest on the couch, a comedy on the flatscreen TV, or a couple rounds of pool. In the evening, prepare the large coffee table with movie-night snacks and drinks. When the laughter begins to die down, move the tasty treats to the end table and set out one of the provided board games for the whole gang. If you’re too excited to sleep, get a toasty fire going in the gas fireplace (beautifully encompassed by stone) to create the optimal ambience for a romance novel in the cushioned wicker rocking chair. In the morning, open the blinds to let in the beautiful wooded views and flip on the ceiling fan to keep cool on summer days. 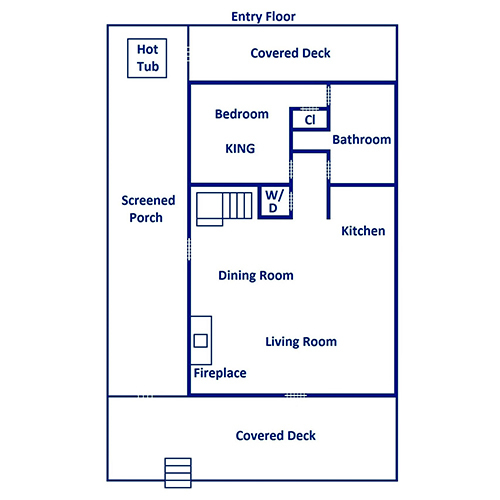 Take a few steps over to the fully equipped kitchen — complete with appliances, dishware, cookware, and bar seating for 3! Grab an ice-cold drink or popsicle on a warm day from the fridge, wash fruit and veggies in the stainless-steel double sink with a sprayer, and brown bagels in the toaster for breakfast. Whip up a tasty dinner on the stove, brew a Colombian blend with the coffeemaker to go with dessert, and pop popcorn in the microwave before the movie marathon starts. Don’t forget to prepare Fido’s favorite meal with the can opener and load the dishwasher before your midday hike in the Great Smoky Mountains National Park! Not far from the kitchen awaits the dining area, eager to serve your every meal — delivery pizza included! Featuring a wooden table with seating for 6, this space is not only useful for dining but also great for morning chats with a cup of joe or evening games with friends. Plus, the large windows facing the front porch bring the lovely treetop views to the table. Head to the entry-level bedroom for a relaxing bath in the en-suite jetted tub — light a few scented candles to really set the mood. Continue to unwind in the king-size bed with your favorite TV show on the big screen TV as you drift off to dream land. Before the kids hit the hay in the twin bunk bed, why not run them a bubble bath in the bathtub-and-shower combo upstairs? After a few hours on the Xbox, a sudsy soak is just what they’ll need! 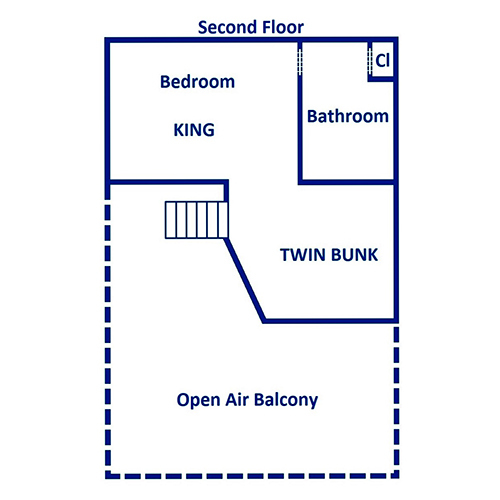 With a flatscreen TV in every bedroom space, let the teens watch a movie from the second floor's king-size bed, and send the younger ones to the bunks with a funny cartoon. The living room also has a sleeper sofa if you need some extra space. As you pull up to the home on the flat gravel driveway with parking for 4, you’ll notice there are only 4 steps into the cabin, making unloading the cars hassle-free! Set the luggage down and venture back onto the covered deck out front for a turn in the porch swing or rocking chairs. 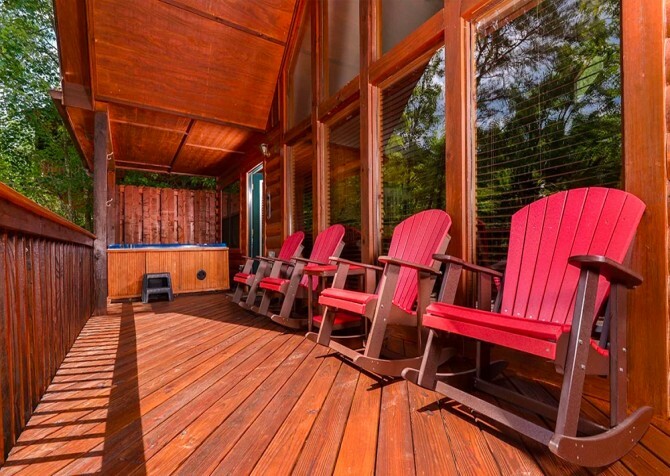 There’s also a back deck with chairs — great for sunbathing and taking in the woodsy scenery. After some time spent on the screened-in deck, enjoy a steak dinner (courtesy of the charcoal, picnic-style grill) outside at the dining table for 4. When the evening sun sets, take a dip in the outdoor hot tub (also on the screened-in deck); there’s even a handy arm chair ready to keep your towels company. While there are plenty of amenities to go around, there are still more to explore! Heading to town? Pick up a tasty treat or a new toy for your pup as this home is pet friendly. After your outdoor adventure in Pigeon Forge, refresh your clothes in the washer and dryer. When movie night rolls around, pop an animated classic in the DVD or Blu-ray player. Ready to get your jam on? Party all night long with your favorite tunes in the CD player. Don’t forget to keep up with emails or binge on Netflix with the complimentary high-speed internet. Get ready for good times in Pigeon Forge, from racing your bestie on a go-kart track and dining on a hearty meal to trampolining indoors with the kids and taking on every outdoor adventure! Knock your friends around on the bumper cars, race your siblings on the go-karts, or spend all afternoon at the arcade — the choice is yours! It’s time for feasting fun at Dolly Parton’s Stampede, an exciting show with acrobatic horse riding, musical performances, and an incredible Southern meal. Jump, climb, compete, play, eat — repeat! TopJump Trampoline Park features indoor trampolines, a climbing area, arcade games, a kids’ zone, and a candy shop for all to enjoy. "Loved it! Beautiful clean cabin and Mountain view! Can’t wait to go back." Thank you for this review! We are so delighted to hear you loved the cabin and mountain view! We can not wait to have you come back in the future! "A beautiful place, great view, very quite, never heard my neighbors. Your high up, and looking down on most cabins near by. You can't go wrong with this cabin. Highly recommended, best I saw in the area."